A senior Chinese religious affairs official has praised the head of the country's Catholic church Fu Tieshan, who died on Friday, as an "outstanding patriotic religious leader". 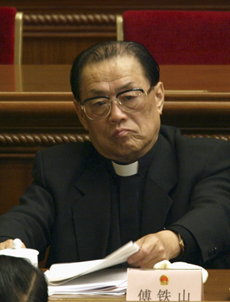 In an article published on Sunday, Ye Xiaowen, director of the State Administration of Religious Affairs, said he felt "gravely sad" at Fu's death, even though he had prepared for the news since hearing that the 76-year-old bishop was chronically ill.
Fu, chairman of the Chinese Patriotic Catholic Association (CPCA), acting chairman of the Bishops Conference of the Catholic Church of China (BCCCC) and bishop of the Beijing Catholic Diocese, was also vice-chairman of the Standing Committee of the 10th National People's Congress (NPC), China's top legislature. "Fu's health has been bad since last year," Ye said, adding that he visited Fu almost every week, mostly in hospital, to seek advice on religious affairs administration and the development of Catholic church. Ye said Fu was deeply concerned about the development of young clergy and the direction of China's Catholic church development. "Fu told me that China's Catholic clergy were on the point of making way for a new generation and it was important to train outstanding young clergy and bishops with high moral and professional standards," Ye said. Fu urged Ye to ensure consistent support from the government and the central authorities of the Communist Party of China for the growth of young clergy, in order to guarantee the succession for China's Catholic church, according to the official. Ye remembered Fu's devotion to the church even in his last days. "Bishop Fu gave his life for the motherland and for his beloved religion. He carried out his religious mission with selfless passion for the country, for the people and for the church," Ye said. Fu was born in Qingyuan County, north China's Hebei Province, in November 1931. He studied philosophy and theology in Beijing's monasteries and became the first ordained and consecrated bishop after China began the reform and opening-up policies. At the weekend, Beijing's southern Catholic church, among many others, hosted large crowd at mass for congregations to mourn their senior bishop. Bishops, clergy and Catholics from around China expressed their condolences. "The bishop was a person of great virtue and prestige. He performed his duties with honor and devoted his life to preaching the gospel in China with a patriotic heart," said CPCA vice chairman Liu Bainian.